We have had very hot, dry weather over the last three weeks. Not very British and make can one feel uncomfortable. The air is still and the heat seems to come from the ground and from above, you can not get away from it. Friday: I am in an empty Caffe Nero, I would imagine most people are on the beach. I would be but the beach car parks are all full and the nearest is a walk of about 10 minutes up a steep hill, defeats the object of cooling down in the sea and then having to do a serious walk back to your car. I was talking to my neighbour today and he has just got back from Poland. Something I did find interesting was that the Polish people in general do not like foreigners, and hate any foreigner getting a job in Poland. When he asked them about all the Poles in England they just shrug their shoulders and say we are stupid. Interesting and I can see why we are having this strong objection to all EU foreigners coming to our country. I do believe the whole ethos of the EU is being questioned and they are doing it through the ballot box. England is leaving the EU on just this issue, others wanting change are Italy, Greece, France, Germany and Spain. The winds of change are blowing strongly, where will it lead? Those who dream of a global society are in for a rude awakening, public sentiment is swinging away and I fear the swing will go a long way back. We see it in the results of all the elections, if a politician want votes, he or she, campaigns for tough immigration laws and invariable wins. I digress. Actually it is Saturday and I am writing this blog on my computer, in the garden. Susan has decided it is time to fix the garden. 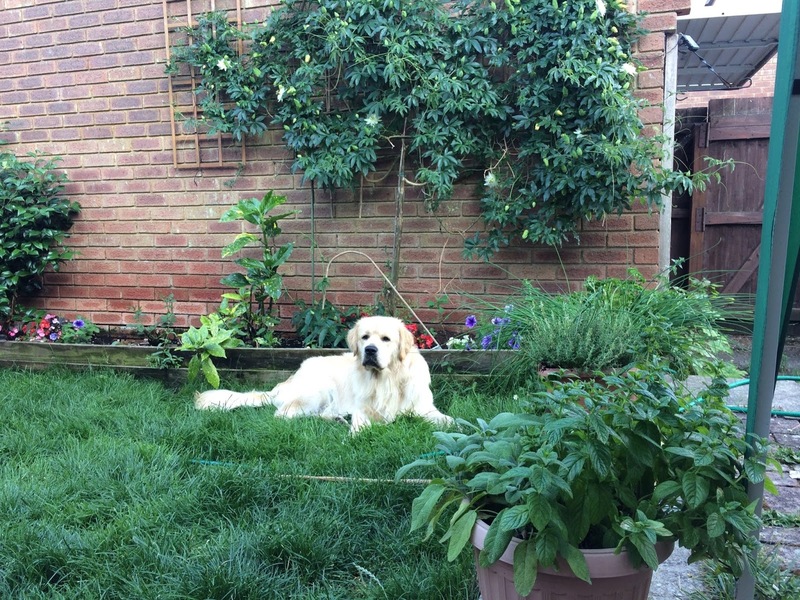 Just to explain, We did have an amazing garden but then we acquired Jenson. 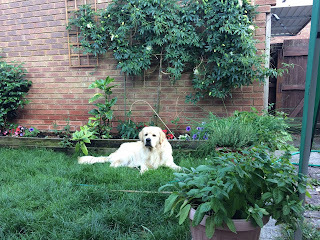 suffice to say we do not have a garden anymore and he has managed to destroy the old rose bush, with all its long thorns as well. Four bags of top soil and one massive bag of compost are being thrown at the garden at the moment, I do feel this is a time when my advise would not be appreciated as I sit and write, enjoying a very good red wine. I have cooked the dinner, and it is quite a culinary master piece.